THINK OF THE upper echelons of the money-management business, and the image that springs to mind is of fusty private banks in Geneva or London’s Mayfair, with marble lobbies and fake country-house meeting-rooms designed to make their super-rich clients feel at home. But that picture is out of date. A more accurate one would feature hundreds of glassy private offices in California and Singapore that invest in Canadian bonds, European property and Chinese startups—and whose gilded patrons are sleepwalking into a political storm. Global finance is being transformed as billionaires get richer and cut out the middlemen by creating their own “family offices”, personal investment firms that roam global markets looking for opportunities. Largely unnoticed, family offices have become a force in investing, with up to $4trn of assets—more than hedge funds and equivalent to 6% of the value of the world’s stockmarkets. As they grow even bigger in an era of populism, family offices are destined to face uncomfortable questions about how they concentrate power and feed inequality. The concept is hardly new; John D. Rockefeller set up his family office in 1882. But the number has exploded this century. Somewhere between 5,000 and 10,000 are based in America and Europe and in Asian hubs such as Singapore and Hong Kong. 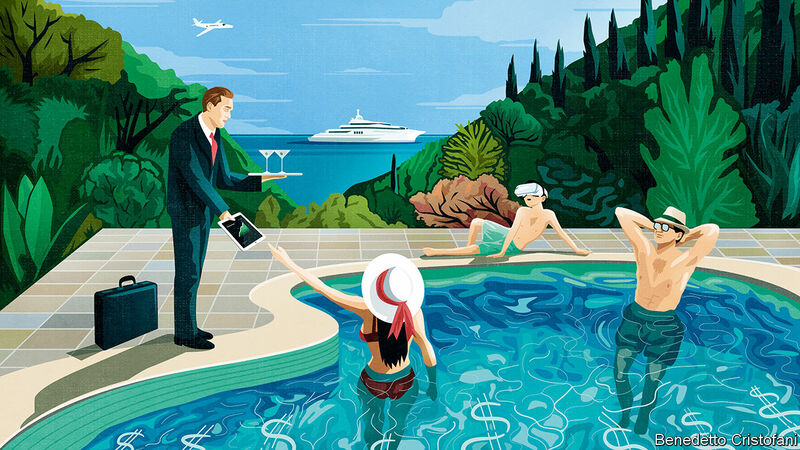 Though their main task is to manage financial assets, the biggest offices, some with hundreds of staff, undertake all sorts of other chores, from tax and legal work to acting as high-powered butlers who book jets and pamper pets. The costs of bringing such expertise in-mansion means that they generally make sense only for those worth over $100m, the top 0.001% of the global pile. Asian tycoons such as Jack Ma of Alibaba have created their own fiefs. The largest Western family offices, such as the one set up by George Soros, an investor and philanthropist, oversee tens of billions and are as muscular as Wall Street firms, competing with banks and private-equity groups to buy whole companies. Every investment boom reflects the society that spawned it. The humble mutual fund came of age in the 1970s after two decades of middle-class prosperity in America. The rise of family offices reflects soaring inequality. Since 1980 the share of the world’s wealth owned by the top 0.01% has risen from 3% to 8%. As the founders of family firms receive dividends or the proceeds of initial public offerings, they usually redeploy the cash. But since the financial crisis there has been a loss of faith in external money managers. Rich clients have taken a closer look at private banks’ high fees and murky incentives, and balked. These trends are unlikely to fade, as our Briefing explains. The number of billionaires is still growing—199 newbies made the grade last year. In the emerging world older entrepreneurs who created firms in the boom years after 1990 are preparing to cash out, while in America and China younger tech entrepreneurs may soon float their companies, releasing a new wave of cash to reinvest. Family offices’ weight in the financial system, therefore, looks likely to rise further. As it does, the objections to them will rise exponentially. The most obvious of these is the least convincing—that family offices have created inequality. They are a consequence, not its cause. Nonetheless, there are concerns—and one in particular that is worth worrying about. The first is that family offices could endanger the stability of the financial system. Combining very rich people, opacity and markets can be explosive. LTCM, a $100bn hedge fund backed by the super-rich, blew up in 1998, almost bringing down Wall Street. Scores of wealthy people fell for a Ponzi scheme run by Bernie Madoff that collapsed in 2008. Still, as things stand family offices do not look like the next disaster waiting to happen. They have debt equivalent to 17% of their assets, making them among the least leveraged participants in global markets. On balance, they may even be a stabilising influence. Their funds are usually deployed for decades, making them far less vulnerable to panics than banks and many hedge funds. The second worry is that family offices could magnify the power of the wealthy over the economy. This is possible: were Bill Gates to invest exclusively in Turkey, he would own 65% of its stockmarket. But the aim is usually to diversify risk, not concentrate power, by taking capital from the original family business and putting it into a widely spread portfolio. The family-office industry is less concentrated than mainstream asset management, which a few firms such as BlackRock dominate. Compared with most fund managers, family offices have welcome habits, including a longer-term horizon and an appetite for startups. It is the third danger that has most bite: that family offices might have privileged access to information, deals and tax schemes, allowing them to outperform ordinary investors. So far there is little evidence for this. The average family office returned 16% in 2017 and 7% in 2016, according to Campden Wealth, a research firm, slightly lagging behind world stockmarkets. Nonetheless, tycoons are well connected. Family offices are becoming more complex—a third have at least two branches—making tax wheezes easier. Hungry brokers and banks are rolling out the red carpet and pitching deals with unlisted firms that are not available to ordinary investors. If all this did lead to an entrenched, unfair advantage, the effect, when compounded over decades, would make wealth inequality disastrously worse. The answer is vigilance and light. Most regulators, treasuries and tax authorities are beginners when it comes to dealing with family offices, but they need to ensure that rules on insider trading, the equal servicing of clients by dealers and parity of tax treatment are observed. And they should prod family offices with assets of over, say, $10bn to publish accounts detailing their workings. In a world that is suspicious of privilege, big family offices have an interest in boosting transparency. In return, they should be free to operate unmolested. They may even have something to teach hordes of flailing asset managers who serve ordinary investors, many of whom may look at their monthly fees and wish that they, too, could ditch the middlemen. It is only natural for a dominant power that finds itself in second place to experience self-doubt or a loss of confidence. But as China's nominal GDP surpasses that of the US, Americans will just have to get over it, as the rest of the world did when America became the single largest economy. OTTAWA – The brewing conflict between the United States and China is typical of zero-sum contests among countries, firms, and individuals. The US is acting under the implicit assumption that if China’s GDP were to surpass that of the US in nominal dollar terms, US economic prospects would be reduced by an amount equal to the margin of China’s gain. The idea that there needs to be a battle over trade or technological dominance at all is very much in keeping with US President Donald Trump’s approach to economic and foreign policy. 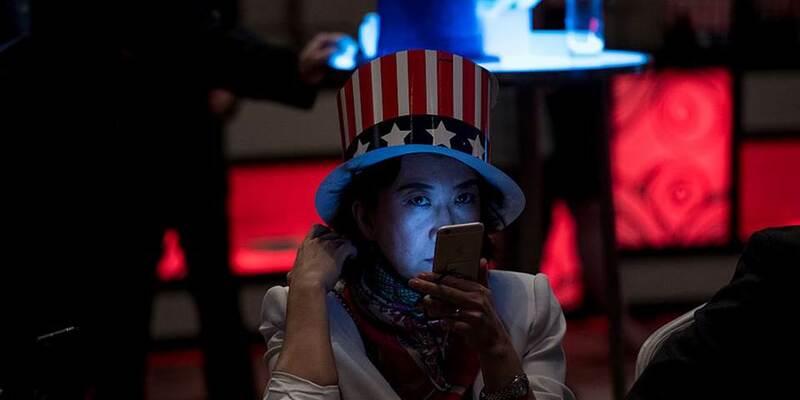 The recent arrest of Huawei CFO Meng Wanzhou in Canada itself raises the notion that the Trump administration is resorting to increasingly cutthroat methods to get its way. Yet lost behind the spectacle of high-profile arrests are a few basic economic facts. For starters, one country’s gain is not necessarily another’s loss. Both the US and China could have vibrant tech sectors that benefit from each other’s innovations. Moreover, China’s economy is a key driver of growth in many other countries, including the US. And given that its economy is already larger than America’s in terms of purchasing power parity, the fear that it will surpass the US in terms of nominal GDP – which is not the same thing as wealth – seems rather beside the point. It is only natural for a dominant power that finds itself in second place to experience self-doubt or a loss of confidence. But the US will just have to get over it, as the rest of the world did when America became the single largest economy. Besides, the two primary factors behind long-term economic growth are the size of a country’s working-age population and its productivity. China has a significantly larger population than the US does, so it stands to reason that it will surpass the US in nominal size at some point (unless it were trapped in a permanent state of poor productivity). The same is true for India. Another factor that has been overlooked is the Chinese consumer. For many businesses in a given economy, the size of the domestic consumer market is the strongest determinant of potential growth. At the start of this decade, Chinese government statistics showed that domestic consumption accounted for 38% of GDP; by the end of 2017, that figure had risen to 42-43%. In nominal terms, China’s consumer market is now around one-third the size of America’s, which is why iconic US companies like Apple sell so many iPhones there. Ten years after the global financial crisis, US domestic consumption remains at around 70% of GDP. But it is unlikely that the global and US economies will be able to rely on this source of demand for another decade, which is precisely why the Chinese market’s rapid growth should be welcomed by all – not least Western companies, whose bottom lines will increasingly depend on Chinese consumers. Given its growth potential, the Chinese consumer market will continue to attract US companies and investors, including from Silicon Valley. So far, Chinese regulations do not seem to have discouraged the big US-based tech companies. Even Google, which left China eight years ago, is reportedly developing a censored search engine to meet the Chinese government’s conditions for re-entering the market. Similarly, leading Silicon Valley investors such as Sequoia have been highly active in Chinese venture-capital start-ups for years. Other countries can certainly disagree with China’s approach to domestic governance. But as a sovereign country, China is justified in pursuing the policies that it sees fit, at least until evidence emerges that its own people object to the course it has charted for itself. The widespread adoption of digital applications such as WeChat – a broader Chinese version of WhatsApp – suggests that Chinese consumers are not particularly put off by government controls, and quite enjoy the wealth of new platforms at their fingertips. Moreover, there has been evidence that some US tech companies appear not to have full control of their own platforms. China’s more controlling line on corporate behavior might not suit freewheeling businesses, but may have some social benefits. As for the Huawei case, if it turned out that the company did indeed violate contractual obligations not to transfer US technology to Iran, then it is only reasonable that there should be consequences. That is true for any exporting business: US secondary sanctions mean that companies and governments everywhere must consider whether their business with Iran is more important than their business with the US. But the US also needs to think carefully about its own actions. At some point, the dollar’s status as a global means of payment and reserve currency could be challenged. If the US is too aggressive in its enforcement of secondary sanctions, other countries might either develop payment systems of their own or forbid their companies from doing further business with US firms. Whether China can become the world’s largest economy without also achieving technological dominance is an open question. But it is not one that other countries should be obsessing over at the expense of their own economic growth and long-term stability. 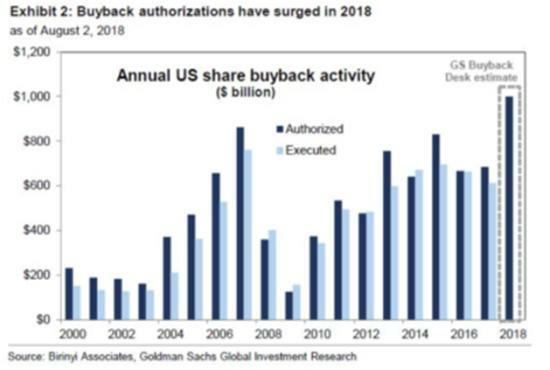 The last few years of the Everything Bubble were driven by the ultimate dumb money: corporations borrowing to buy back their stock at record high prices. A whole generation of CEOs and CFOs were able to pad both their reputations and their year-end bonuses this way while, it seemed, blatantly screwing over their employees and other stakeholders. Like most other kinds of criminal negligence, this had to end eventually, giving its critics a chance to indulge in a bit of long-overdue Schadenfreude. The perfect storm of zero percent interest rates that existed concurrently with a debt-disabled economy lured executives at major corporations into a decade-long stock buyback program. The Fed pumped money into the economy thru its various Quantitative Easing programs to force interest rates near zero percent, with the expectation corporations would borrow money at the lowest rates in history and then invest in their businesses in the form of Property Plant and Equipment (capital goods). This in turn would expand productivity and help foster a low-inflation and strong growth environment. But many corporate executives found a much more enticing path to take in the form of EPS manipulation. That is, they boosted both their companies share price and, consequently, their own compensation, by simply buying back shares of their own stock. For the most part, companies have used debt to finance these earnings-boosting share purchases. Stock buybacks have been at a record pace this year. This is a short-term positive for shareholders because it bids up the stock price in the market; just as it also reduces the shares outstanding. This process boosts the EPS calculation and increases cash flows as fewer dividends are paid to outside shareholders. As an added bonus, it also provides for a nice tax write-off. Wall Street is easily fooled into thinking valuations are in line using the traditional PE ratio calculation. But this metric becomes hugely distorted by share repurchases that boost that EPS number. Other metrics that are not as easily manipulated, such as the price-to-sales ratio and the total market cap-to-GDP ratio, have been screaming the overvaluation of this market in record capacity. Traditionally speaking, a company decides to buy back shares when they believe their stock is undervalued. But from 2008-2010–a time when stocks were trading at fire-sale prices, companies bought back very few shares. However, it was only after Wall Street became confident that the Fed’s printing presses were going to stay on for years that share purchases went into overdrive—even though the underlying economic growth was anemic. The truth is the volume of debt-sponsored share buybacks over the past few years is putting many companies at an extreme level of risk. According to Bianco Research, 14% of S&P 500 companies must now issue new debt just to pay the interest on existing debt. In other words, these Zombie companies are actually Ponzi schemes that can only continue operations in a near zero-percent interest rate environment; and if the credit markets remain liquid. But, both of those conditions are rapidly moving in the wrong direction. Share buybacks have a metric known as the Return on Investment or “ROI,” which tracks post-buyback stock prices to measure the effectiveness of corporate repurchases. The fact is that corporate executives have a miserable track record when it comes to their ROI on share repurchase programs. One such example of this is Chipotle. According to Fortune Magazine, the company spent heavily on share repurchases in the first quarter of 2016, at the height of their E Coli scare. Subsequently, these shares have crashed, giving the company an ROI of minus 23%. Then there is General Electric. Between 2015 and 2017, GE repurchased $40 billion of shares at prices between $20 and $32—its share price sits around $6 today. The company has destroyed about $30 billion of shareholders’ money. It lost more on its share repurchase programs during those three years than it made in operations—and by a substantial margin. But GE is just one of several hundred big companies who have thrown good money away on bad share buybacks. Big Tech icons Apple, Alphabet, Cisco, Microsoft, and Oracle, have bought back $115 billion of stock in the first three quarters of 2018. But now these share prices are headed down. In fact, IBM has lost 20% of its value this year alone. The company bought back $50 billion of its stock between 2011 and 2016 and ended the second quarter with $11.9 billion of cash on hand; but its debt totaled $45.5 billion. In other words, these companies are destroying their balance sheets for a short-term boost in stock prices that has now gone into reverse. When overleveraged companies are faced with soaring debt service payments, the results are never good. Indeed, as the global economy continues to deteriorate, look for the rate of bankruptcies and unemployment claims to skyrocket. Corporate America has leveraged itself to the hilt to buy back shares. Once again, with impeccably bad timing. These companies will now have to raise capital to strengthen their balance sheets just as interest rates are rising and the recession of 2019 unfolds. Then, these same companies who bought back their shares at the highs will soon have to pull those same shares out of retirement and sell them back to the public at much lower prices. Thus, diluting the shares outstanding and lowering EPS counts yet again…Wall Street never learns. The US has come out against an increase to the International Monetary Fund’s permanent reserves, dealing a blow to efforts by Christine Lagarde, its managing director, to put the institution on a more stable financial footing. David Malpass, the US Treasury’s undersecretary for international affairs, told a congressional committee on Wednesday that the US is “opposed to changes in quotas”. He argued that the IMF has ample firepower and countries have developed alternative resources to draw on in a crisis. Ms Lagarde had embarked on a drive to persuade the IMF’s largest shareholders to back an increase in the organisation’s permanent firepower around the time of its annual meetings in Bali, Indonesia, in October. Had the US supported the idea of an increase in IMF quotas, it would have probably triggered a positive response from other leading countries as well. While the US appears to have shut the door on an increase in the IMF’s permanent reserves, it appears to have left it open when it comes to US backing for alternative funding mechanisms, for example a renewal of the NAB — the borrowing facility that pools temporary contributions to the IMF from its members. While the IMF has plenty of available cash, the expiration of borrowing arrangements in the coming years is expected to sharply shrink its resources, potentially constraining its capacity to rescue financially troubled economies. The Trump administration’s decision to shy away from a permanent boost to IMF resources reflects its aversion to multilateral institutions. While an increase for the IMF would have strengthened an institution that has for decades been synonymous with the US-led international economic order, it would have inevitably allowed emerging markets, including China, to wield greater influence within the organisation, at a time of high tension between Washington and Beijing. The US enthusiastically backed this year’s IMF bailout of Argentina, the largest in its history, but has been more sceptical of IMF interventions in countries that are big recipients of Chinese investment, such as Pakistan. Speaking to the House Financial Services Committee, Mr Malpass said: “We will be seeking a constructive size for IMF resources that contributes fully to the stability of the international financial system, but recognises that the IMF is just one part of the global financial system and its various support mechanisms. Mr Malpass said in his testimony that he met Ms Lagarde last week to discuss funding needs, and that the administration would notify Congress within a few weeks of the formal start of negotiations with the IMF. Gerry Rice, the IMF’s chief spokesperson, said it had taken note of Mr Malpass’s comments. “The fund currently has the financial means to fulfil its role in the global financial system, and we will continue to provide advice and program support to our membership in line with our policies,” said Mr Rice.